WeHighlights 2018 NL - URL NOG AANPASSEN - New environmental regulation is on its way. Now what? 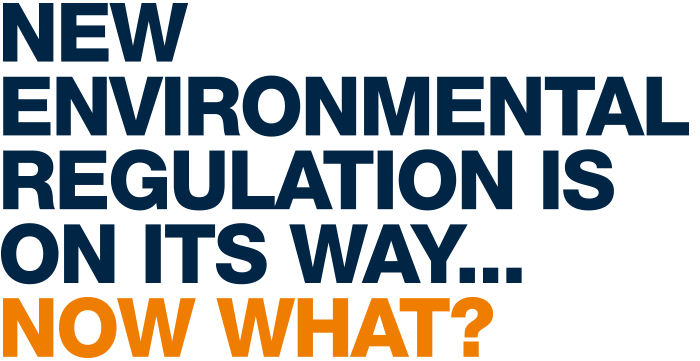 23New environmental regulation is on its way. Now what? In 2020, emissions regulations for sulphur will become more stringent. After that, all ships worldwide will have to satisfy emissions requirements in the area of SOx. This will require investments. But which investments? What is the best solution for a given situation? Sjoerd Boersma, Sales Representative for Environmental Products and Pumps at Wärtsilä brings you up to speed about the opportunities and the considerations. WHY IS THE TOPIC OF "EMISSIONS" SUDDENLY AT THE TOP OF THE AGENDA? ‘The International Maritime Organisation (IMO) has concluded various agreements to have the shipping sector contribute more in the coming years to a better environment. But it's not that simple. The so-called ‘Global Sulphur Cap’ agreement is one of the newly placed standards and involves the emissions of SOx, sulphur, in fuels with high levels of sulphur. "High-sulphur fuel is already forbidden for inland waterway shipping. But the entire maritime sector, also the marine part, will soon have to contribute to the limitation of sulphur emissions. This means that shipping companies will have to make a choice. And this is an unwelcome fact for most parties in the fragmented market with increasing oil prices. Still, no one can simply ignore the more stringent environmental requirements because, starting now, it's basically a very clear choice: either you invest in measures or you wait to see which new fuels become available." WHAT MEASURES SHOULD WE INVEST IN? "In fact, there are only two options for existing vessels: you either sail using clean fuel, or you install a scrubber. You might think things won't proceed all that quickly, since no one's really coming to take exhaust samples when your ship's lying off the coast of Africa next month. But that's why we're now working on a change to the regulations which would put you in violation simply by not having a scrubber on board if you have any sulphur-containing fuel at all. So, you really have to think now about what you're going to do. Will your ship still be chartered after 2020? International Maritime Organisation (IMO) Climate Agreement. This is sometimes referred to as the "Paris agreement". The climate agreement from the International Maritime Organisation (IMO) wants to have the sector reduce CO2 emissions (or greenhouse gas emissions) for every ship's transport performance by an average of at least 40% in 2030. The goal is a reduction of 70% by 2050. The absolute reduction of CO2 must be at least 50% in 2050, all compared to 2008. Furthermore, the Energy Efficiency Design Index (EEDI) will be tightened further in order to make new ships being built even more energy efficient. Global sulphur cap: in January 2020, the percentage of SOx sulphur in high-sulphur fuels (heavy fuel oil - HFO) may not exceed 0.5%. This agreement was concluded by the International Maritime Organisation (IMO) on 27 October 2016 and takes effect starting in January 2020. Emissions of SO2 in the shipping sector depend primarily on the sulphur concentration in the fuels used and on the amount of fuel used. Acid rain is purported to be a consequence of SOx. And then there's the reduction of NOx. This applies to the so-called ECA areas and affects primarily new construction. In October 2016, the environmental committee (MEPC) of the International Maritime Organisation (IMO) convened. The decision was made to designate the North Sea and the Baltic Sea in 2021 as so-called NECA, where more stringent nitrogen emissions standards apply. NECA stands for NOx (nitrogen oxides) Emission Control Area. "A scrubber is an exhaust gas cleaning system or, in other words, a post-processing system. There are various types of scrubber systems: open systems, closed systems and hybrid systems. This means that one system uses seawater to flush and the other system circulates seawater with the addition of chemicals. As the market leader with 17 years of experience, we have both systems in-house. Many manufacturers offer only the in-line scrubbers, but we do both in-line (in which the scrubber replaces a part of the straight exhaust and is installed on the straight exhaust pipe) and venturi (in which the scrubber is on the bypass of the existing exhaust). Generally speaking, the in-line is more suitable for smaller installations or larger installations in which only the main engine is connected to the scrubber; the Venturi is more efficient, suitable for multiple engines on a single scrubber and for larger installed capacities." DOES THE AGE OF THE SHIP AFFECT THE CHOICE BETWEEN LOW-SULPHUR FUEL AND A SCRUBBER? "Yes, a conscious choice is necessary, especially for newer vessels. After all, the expected lifespan of your ship determines how profitable your scrubber is. Older vessels are likelier to switch to new, expensive fuel in order not to have to invest in a scrubber. But it's also possible that older ships are depreciated more quickly. The tipping point - i.e. when should you choose a scrubber or for low-sulphur fuel for a particular vessel's age - is different for each market and type of ship. For this reason, we provide bespoke advisory for everyone." IS THE MARKET SUFFICIENTLY INFORMED TO MAKE A CONSCIOUS CHOICE? "The market simply has to get ready for this choice. The sector has responded slowly up until now since it's usually the owner who must pay for the scrubber and not the party who pays the fuel bill. Nonetheless, ships' owners also earn back the investment, because the likelihood of keeping your ship in operation is considerably greater with a scrubber. In other words: charters are expected to select those owners who do indeed dare to make the investment." Complies with the new emissions standards of 2020. You don't need to invest in a scrubber. Currently, low-sulphur fuel is approximately €200 per ton more expensive than high-sulphur fuel. The question is whether low-sulphur fuel is sufficiently available. Only the ISO standard applies to low-sulphur fuel (LSFO). The question is whether this standard is sufficient to guarantee good quality fuel. The expectation is that there will be considerable mixing with low-sulphur fuel in order to satisfy demand for the new fuel. But no one has yet considered what will happen when you start mixing blends. If you switch to low-sulphur fuel, you will have to talk to your fuel supplier about whether you also need another lubricant. Low-sulphur fuel and blends may also carry consequences for installations. This may mean that your guarantee will lapse. Ask your engine supplier about this and check with the classification society about how to deal with this in terms of insurance. A scrubber offers you the opportunity to keep sailing using high-sulphur fuel while still complying with the most recent requirements. High-sulphur fuel is expected to remain cheaper than the new low-sulphur fuels, so the fuel bill will not be any higher than it is now and will remain lower than the alternative. A scrubber also removes a portion of the particle matter (PM): fine particulates, carcinogenic dust in exhaust gases. Especially the largest particulates. If you opt for a scrubber from Wärtsilä, then you are choosing a total solution, because Wärtsilä looks further than simply the scrubber. For example, we ask about the vessel's specifications so that we can take a good look at what's possible and what is fitting. The installation of a scrubber requires a considerable investment. A scrubber is not a plug-and-play device: the crew must be trained. This is the reason that Wärtsilä organises scrubber training sessions in our Land & Sea Academy in Drunen.